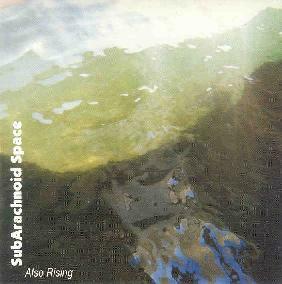 With the exception of last year's split LP with Bardo Pond, Also Rising is SubArachnoid Space's first recording since the dual releases of These Things Take Time and A New And Exact Map in 2000. The band still consists of Mason Jones and Melynda Jackson on guitar, Chris Van Huffel on drums, and bassist Stoo Odom has been with the band since 2000 though this is and the split LP are the first recordings he's appeared on with the band. SubArachnoid Space have come a long way since the drones and thick walls of harsh psychedelia that characterized their earliest recordings. One of the things that really struck me when I got to see the band perform live last October was the prominent Rock element to the music. The band was completely in space but came across more as a rock band than anything I'd heard on their recordings. Also Rising features the band playing very much in this style and the result is a set of music that is easily the bands very best to date. The album is meant to be played in its entirety and the songs, for the most part, transition smoothly from one to the next. Tracks like "The Harsh Facts Of Life" and "Burn Shot" are among the most powerful and heavy rocking that I've heard on SubArachnoid Space's recorded works. "The Harsh Facts Of Life" opens the set and took me completely by surprise. It consists of heavy driving power rock with Van Huffel keeping a steady but commanding pace and Odom's bass firing off potent metallic rhythmic blasts. From the guitars we get power chords, frantic, anguished notes and phrases, and swirling trip patterns. What an opener... truly powerful and completely spaced psychedelia. "Tigris" begins equally as potent, but soon settles into a trippier strolling groove that builds slowly until the drums and bass are pounding while the guitars swirl in the background. The track is a shortened version (though still 10 minutes) of the bands contribution to the split LP with Bardo Pond, and a note on their web site says that here the song is reproduced in the way that they've been playing it live. "Deep End" is a slowly developing astral journey that starts off with an easier pace. The guitar patterns are rapid fire but crystal clear and the effects are just as heart stopping as they are mind bending. The band creates a massive wall of sound, yet each individual contribution is distinct. "Untitled" continues the wailing and screaming space guitars that built up on "Deep End". The intensity level is bursting the mercury and the rhythm section achieves King Crimson-like levels of power. "Angel Food" is space heavenly and, as the title states, angelic. "Dateland" has a similar vibe, though it builds to much higher levels of volume and intensity. "Down Nod Out" is a mellow song with a guitar line that trips along, alternating between a kind of Robert Fripp and more soaring and penetrating psychedelic sound. Closing the set is a bonus jam recorded on a boombox in the bands rehearsal space. In summary, SubArachnoid Space have matured in leaps and bounds over the years and their music now feels goal oriented and even composed, without sacrificing the freeform jamming quality that has always made them such a top notch group of space explorers. This will easily make my best of 2003 list. HIGHEST recommendation. For more information you can visit the SubArachnoid Space web site at: http://www.subarachnoid.com. Also Rising is distributed by Strange Attractors Audio House. You can visit their web site at: http://www.strange-attractors.com.